The “Royal Palace at Quisisana” is practically unknown even to those who know the area; yet it lays claim to being the first such royal residence in the north of the ancient Kingdom of Naples, older even than the Angevin fortress at the port (from 1300). Quisisana is now part of the town of Castellammare di Stabia, at the beginning of the Sorrentine peninsula. The name apparently derives from Qui-si-sana (“Here you get healthy”), for here is where the Swabian dynasty, the Hohenstaufens (Frederick II), way back in the 1200s decided to build a royal residence on a hillside at about 400 feet above the sea so they could look out over the bay and get healthy. The other story is that the residence was built by Robert of Anjou in 1310 after a miraculous cure happened in the area. In any case, here is where you get well again. Over the centuries there have been various villas built on the grounds. In one form or another, they were a popular stop for artists and writers (even Boccaccio set parts of his Decamerone here). In the 1500s the property came into possession of the Farnese family. Elizabeth Farnese, the Queen Consort of Spain was the mother of Charles III of Bourbon, who then inherited the property. In the 1730s he became the first king of Bourbon Naples. The villa was then remade into a typically sumptuous Bourbon estate. 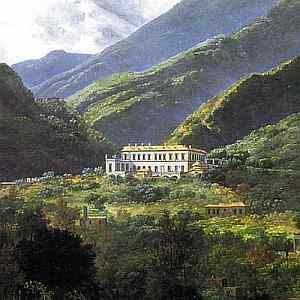 The recently restored building that you see today (photo, below) is that Bourbon villa from the late 1700s. 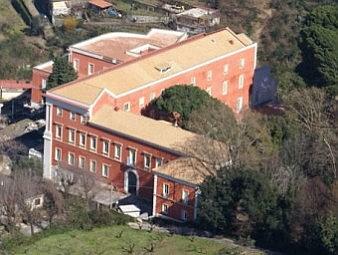 Thus, Quisisana was inhabited by various members of the dynasties that ruled the kingdom of Naples, right up to when Giuseppe Garibaldi used the Bourbon villa as a hospital for his men during his conquest of the kingdom in 1861, leading to the unification of Italy. The property was appropriated by the new Italian state and then sold to the town of Castellammare in 1879. The premises were about 12 acres; they contained the two-story main mansion with 100 rooms and typical royal trappings: workshops for making candles and saddles, riding grounds, two stables, a farm house, a church, various quarters for servants, and a five-acre park. Quisisana became the Hotel Margherita in 1898, but remained little used for a number of years. It was a hospital in WWI, converted to a luxury hotel in the early 1930s, became a hospital again in WWII and was abandoned in the 1960s; the 1980 earthquake pretty much finished off what was left. Plans for restoration were drawn up in 1994 and work started in 2002. Quisisana is now restored, but to what end nobody seems to know. Proposals have been made to turn it into (1) an archaeological museum, or (2) a school for the restoration of art and antiques, or (3) a deluxe hotel, or (4) a gambling casino. The point of all these proposals is to help turn Castellammare around economically. Compared to nearby Pompeii and Sorrento, the town of Castellammare has never really been much of a tourist attraction to begin with. For centuries, the town worked for a living at the shipbuilder’s trade; the town was the site of very successful shipyards for centuries. That trade, too, has fallen upon hard times.